Ten years after the Pilgrims arrived on the Mayflower, the Puritans came to Massachusetts. 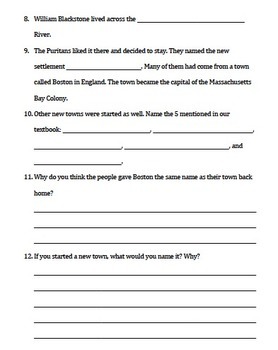 This worksheet should be completed using the Massachusetts, Our Home third grade textbook. It can be used as a review before a test or as a way for students to remain engaged while reading for meaning. There are 12 fill in the blank/short answer questions. Great for completing independently or in partners! Don't forget to click on the green ★ to stay up to date on all of the latest products and freebies!